1976.27.12.height 165 cm, weight 54 kg. without bad habbits, no children. sporty. Photo would be appreciated. I am going to visit Finland 7.11.02-10.11.02. Привет меня зовут Андерсен мне 21 год. для переписке и большее. Пишите я отвечу всем. Желательно с фото отвечу тем же. people in Finland,if there're some!! My interests are.....We'll talk about it later,ok? tutustua vakavaan suomalaiseen. Opiskelen suomea. because I have possibility to get acquainted with YOU. in Russia, in the lovely big Russian city Saratov on the Volga River. that in everything that I do. That I am reliable, serious, and with a great sense of honor. I enjoy humor and simple things that make me smile. you are really wonderful and interest person. Меня зовут Наташа. Мне 25 лет. Хочу познакомится с человеком для дружеской переписки и общения. музыку, носил длинные волосы(хотя можно и без них). Очень хотела бы изучить финский язык, т.к. он мне нравится. leila 159/57/40 познакомлюсь с мужчиной из Finland. Мне 40лет,я шатенка с зелеными глазами. из Финляндии для серьезных отношений, брака. 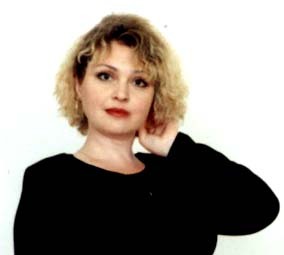 Olga Potapenko. 30/160/62 I looking for the man from Finland. I am charming woman with blond hair and green eyes. I have open mind and good sense of humor. I'm generous, tactful, intelligent, patient, sensitive, loyal and not selfish. favorite), like theatre, cinema, nature (sea, forest, mountains). I like sport (running, walking). I have many friend, we meet together sometimes. good film ( comedy is my favorite), or knit warm socks, et. I like pets and have a beautiful gray cat ( she is very clever). My hobbies : psychology, music (classical, jazz, modern). I prefer healthy food and like cooking. I like cosy home and spend time together with close people. The most important things in my life are close people and family. build up a strong relationship and family with. Разведена, дети взрослые, живут самостоятельно. для жизни и совместного бизнеса. высшее инженерное образование, зовут Олег. a man who will be my friend, my lover, my husband. true. I am looking for a man I could love. проводить свободное время с друзьями, цветы. с которым можно будет прожить интересную насыщенную жизнь. Возраст, секс и внешность значения не имеют. найти работу в Финляндии, в свободное время. My name is Nadin.I'm a college teacher of English. .I live alone.I can't complain on my life. but a person to understand and respect me. для брака (в т.ч. фиктивного). Мне 30 лет. Сейчас я в Финляндии. Петр. потому что ей нравятся фины. 35-55 y.o. from Suomi for serious relations and marriage. без в/п, в браке не состоял. My name is Ludmila, 42 y.o., 167 cm, 70 kg. Divorced, has 2 children (13 and 17 y.o). I love home, nature, travel. I live in Karelia, in Olonetz. I would like to meet a man without bed habits to marry.